Anyone can get a Vietnam Visa Approval Letter by following iVisa's simple Vietnam online form. The document can be obtained online in as little as 8 hours. It must be presented when boarding your flight and to the immigration officer upon arrival. Our experience of over four years, and the thousands of satisfied customers worldwide who have received their Vietnam Visa approval letter, are the result of working with the most experienced professionals and the safest/most effective technology to process the Vietnamese visa. Additional visa fee for Vietnam Visa on Arrival (payable to airport immigration). The stamping fee is $25 for single entry visa (both 1 month and 3 month type) and $50 for multiple entry visa (both 1 month and 3 month type). Your passport must be valid for at least six months after your indicated arrival date. Passport photos are required at Vietnam airports in order to obtain an entry visa. Visa on Arrival is only valid for air travelers. At your arrival, you will be required to fill some documents to get the visa stamp in your passport. Visa on Arrival works at any of Vietnam’s three international airports: Tan Son Nhat (Ho Chi Minh City); Noi Bai International Airport (Hanoi); or Danang Airport (Da Nang). There will be no problems going between these three airports. Travelers are required to pay a stamping fee on arrival. The stamping fee is $25 for single entry visa (both 1 month and 3 month type) and $50 for multiple entry visa (both 1 month and 3 month type). The arrival date you provide should be the earliest you plan to arrive, but you can arrive after that date. The departure date you provide will be the last day you are permitted to be in the country unless you get a visa extension. A Visa on Arrival is a process where you obtain an approval letter for entry into Vietnam. The actual Visa will be issued upon arrival in Vietnam. Note that upon arrival, you must present the VOA letter, along with your passport, 2 passport-size photos, and pay the appropriate visa stamping fees. Please note that on the VOA letter, you may at times see other travelers names listed. This is because the government approves travelers in batches and thus, this is how they are issued. You will need to fill out the online form completely and accurately, but we do not require you to submit any documents to us. Visa stamping fee, which needs to be paid in cash (25 USD for single entry, 50 USD for multiple entries). What is the cost to obtain a Vietnam Visa on Arrival approval? The cost is 20 - 45 USD for standard processing. For rush and super rush, the cost is 50 - 75 USD and 80 - 105 USD, respectively. The actual cost will depend on the number of entries and maximum length of stay options you choose. How long will it take to process my Visa on Arrival approval? How long is a Vietnam Visa on Arrival valid for? The visa will be valid for 30 or 90 days from arrival, depending on the option you choose at the time of application. Note that an extension of stay can be applied for once in Vietnam. However, it can be a difficult process, so if there is a chance that you will exceed the 30-day stay, we recommend applying for the 90-day option. What conditions must the applicant’s passport meet for the Visa on Arrival? Applicant’s passport should have at least 6-months validity from the time of entry into Vietnam and at least one blank page. How to apply Visa on Arrival? Type of visa: 1 month or 3 months, single entry or multiple entries. Step 2: Pay and receive confirmation After fill out all your information, you will be asked for payment of service fee. Step 3: Get Vietnam visa approval Letter. Receive Vietnam visa approval letter via mail. 45 USD/person for single entry 1-3 months. 65 USD/person for less than 30 days visa multiple entries. 95 USD/person for 1-3 months multiple entries. 135 USD/person for 6 months multiple entries visa. Will I have to pay a visa fee once I arrive in Vietnam? Note that if you are issued a multiple entry visa, you can enter/exit Vietnam from any entry point (airports, seaports, land checkpoints) once you are inside Vietnam. Can I enter Vietnam earlier than the date stated in my approval letter? No, you are not allowed to enter Vietnam before the date stated in your Vietnam visa approval letter. That depends. If you require multiple entries and/or are planning on staying in Vietnam for longer than 30 days, the VOA will be the best option (as long as you are entering via one of the 3 international airports that have Visa on Arrival issuing capabilities). Should I choose a single entry or multiple entries? That depends on your travel plans. If you intend on staying in Vietnam for the entire duration of your trip, a single entry visa will suffice. However, if you plan on visiting any surrounding countries (Laos and Cambodia for example) then you will want to get a multiple entry, as it will cover all your entries/exits to and from Vietnam. Service fee: is paid for getting a Visa Approval Letter via our Online Payment System after filling full your information to the visa application form. Stamping fee: is paid in cash to Vietnamese Immigration Officer at arrival airport for your visa stamp. Where do I get my Vietnam Visa Stamped on arrival at airport? At the arrival hall inside the airports, there is a landing visa counter, in front of the check in point counter, You have to prepare some documents to get visa stamp: 2 photos 4x6 cm, immigration form and some cash in USD. ( 1 month, 3 months single : 45 USD, 1 month multiple is 65 USD, 3 months to less than 6 months is 95 USD and 6 months is 135 USD). Vietnam visa on arrival at the airports is approved when you already have visa approval letter in advance. You will have to prepare some cash for stamping fee and 2 photos 4x6cm ( same size with passport picture) at the airport when you arrive. But this is not very important if you don't have photos on your hand, you can take picture when you arrive and you have to pay 5 USD for this case. No, you are unable to enter Vietnam earlier than the date which state on your Vietnam visa approval letter. In this case, you must apply again to process a new Visa with your correct arrival date. Can I enter Vietnam by sea or by land with my approval letter? 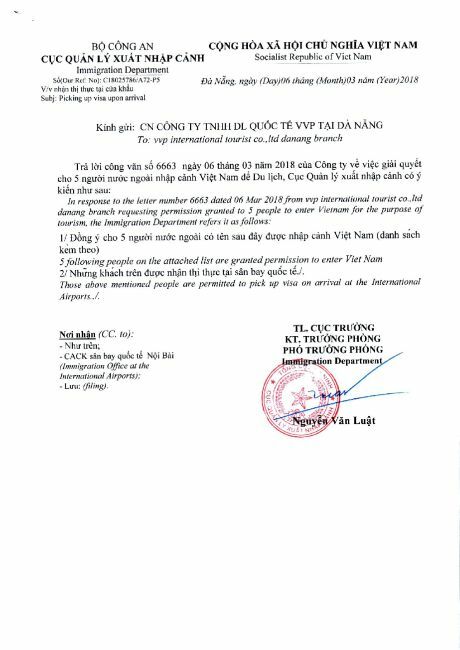 We kindly inform that you can not enter Vietnam by seaports or land crossing boder with our approval letter. In this case, we recommend you should contact with Vietnam Embassy to get visa stamped on your passport before your departure. we arrange the visa for all who would like to get visa at the airports only. Is a single entry or multiple entries better for my purpose? A single entry visa allows you enter/ exit Vietnam one time or it is also called visa with single use. Once your single entry visa used, you can not enter again Vietnam with this used visa. You must apply for the new one if you want to come back Vietnam again. For example, with 1 month single entry visa, you can enter Vietnam to stay for less than 30 days. You can not re-enter Vietnam if you exit Vietnam after 10 days staying, even your visa valid for 30days. When the expired day of your Vietnam visa comes up, please contact directly the Vietnam Immigration Office in which located at 40 Hang Bai street ( Hanoi); 161 Nguyen Du street ( Ho Chi Minh city) or any local Vietnam Immigration Offices where you stays in. The Vietnam Visa Approval Letter is a pre-approved application you need before entering Vietnam. If you have no free-time or stay far away the local Vietnam Embassy, our service can support you quickly and most conveniently. to apply the pre-approved letter for Vietnam Visa. Business trips abroad are never easy. You are going to face a different culture that has different customs and etiquette, which is why some proper research is required before leaving. The same goes for Vietnam. The Vietnamese business people expect you to behave a certain way, just as you would if they came to you. It is only natural to respect each other’s cultures and traditions, and not doing so may lead to failure. As a result, if you plan on going on a business trip, you should probably learn a few aspects of their etiquette. There is nothing out of the ordinary, and you will make a very good impression if you express your interest in the Vietnamese culture. First of all, all the meeting with a Vietnamese delegation should be schedules weeks in advance, even if you are not already in Vietnam. Plus, you need the time to hire an interpreter since English is not well spoken, especially by senior associates. You can make an agenda if you would like to, but it will not always be respected since Vietnamese people will go from one topic to the other as they like. It is not a sign or rudeness. It is just how they do things there. When you first meet the Vietnamese delegation, giving out your business card is more of a ritual than a habit. When you hand out your business card, you need to do so using both hands. Also, make sure that it does not cross someone’s head, say someone that is sitting down. Plus, to show your dedication and respect, you need to translate your card and put the Vietnamese version on the back. As mentioned before, Vietnamese business people do not speak English well enough for meetings. At the same time, when you are given a business card, do not look at it superficially and then put it in your pocket or on the table. You need to receive it with both hands, take a good look at it, and then place it wherever you want with care. You need to show the people present that you respect the card, even if you think that it is not such big of a deal. Dress etiquette is nothing out of the ordinary in Vietnam. Men must wear suits on all formal meetings, although when the weather is too warm, you can lose the jacket. Women must dress conservatively as well. Suits and dresses are acceptable, but decency should always be out first. Nothing too tight or short is acceptable. The dress code in the Vietnamese business world differs from one region to the other. For example, Southern Vietnam is far more relaxed than the Northern part of the country. In Vietnam, gift giving in quite common, but you should always wait until the end of the meeting or before you leave your host’s house. However, you do not need to go overboard with your gift. A small item with your company’s logo on it is more than enough. When you are invited to a meal with the Vietnamese delegation, you must wait for the senior associates to be seated first. When you are invited to someone’s house for a meal, you need to wait for the host to sit down first. Also, you need to stand until the host tells you where to be seated. As for the business mentality in Vietnam, you must not expect much. When an issue arises, the Vietnam people are a ‘whatever works’ kind of people. They are not pretentious, and as long as everyone gets up from the table satisfied, every solution is a good one. At the same time, you should know that the Vietnamese people worship Confucius and his philosophy. With that in mind, they value the relationship they establish with you before engaging in business. That is why some Vietnamese people will first try to get to know you before closing a deal. The first meeting will be scheduled for that purpose alone. This is a tricky step because Vietnamese people are usually very private. They do, however, want to know more about you on both personal and business levels. One thing that you must always remember is that Vietnamese business people are all in for saving face. If you criticize someone, all you can expect is silence because they want to save face at all times. Their reputation is very important, so you should try as much as you can to keep all criticism or complaints private. If you do have something to say, you should always take someone aside and express your concerns. It is a more controlled environment, and your chances of getting what you want are higher. Another thing that you should expect is for the negotiations to last a while. In Vietnam, people want to get the best possible deal, not that it would be any different anywhere else. However, the Vietnamese will do almost anything to get what they want. One of their strategies is to prolong the discussion for a very long time hoping that you will somehow yield. If you do not, they will not be offended. They just want to try before closing a deal. In Vietnam, business people prefer to make cash transactions rather than credit. Only people that have a long history of successful collaborations will be able to use credit. When it comes to this, you would best prepare cash if you have never transacted with these people. Things should never get to court because the process takes a very long time and it is costly. Plus, as a foreigner, you already are in a disadvantage in front of the courts in Vietnam. As long as you keep in mind that Vietnam has a whole different culture than your own, your business trip should be successful. The tips above should help you to at least get started, and if you still have doubts, you should refer to someone that is working in Vietnam. There are, some would say, unwritten law for Vietnamese.